Doctor’s Best Instantized BCAA Powder contains a blend of L-Leucine, L-Isoleucine and L-Valine, which are essential amino acids that the body cannot synthesize on its own and therefore must get through dietary sources. 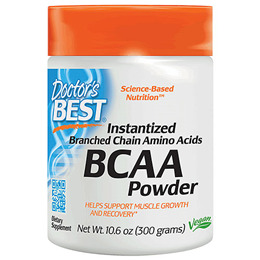 BCAAs, unlike most other amino acids, are metabolized within muscle tissue, allowing them to be used as energy by muscle cells to produce cellular energy in the form of ATP. L-Leucine, L-Isoleucine, L-Valine, Sunflower Lecithin. Add 1 scoop of powder to 8 oz. of water, juice or protein shake and mix well. For best results, drink 1 hour before exercise. Repeat after exercise, before bed, or as recommended by a nutritionally-informed physician. Consult your physician prior to use if you are taking corticosteroids or any medication for diabetes or thyroid. Avoid using if you are pregnant, lactating, 2 weeks prior or after surgery. Below are reviews of Instantized Branch Chain Amino Acids Powder - 300g by bodykind customers. If you have tried this product we'd love to hear what you think so please leave a review.